Charlotte is the largest city in North Carolina and a regional economic hub. Drivers from many neighboring communities commute into Charlotte where motorists, transit users, bicyclists, and pedestrians interact. 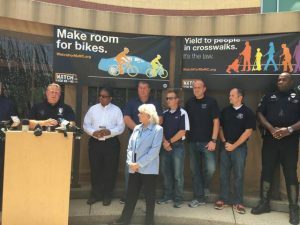 Since joining Watch for Me NC, the City of Charlotte and its partners have engaged in a variety of enforcement, public outreach, and education events to improve safety for all road users. Charlotte attributes much of its success with the Watch for Me NC program to the strong and supportive partnerships it has built. Included among its numerous partners are the Charlotte-Mecklenburg Police Department, the Charlotte Area Transit System, the city’s two major hospitals, AARP, Charlotte City Center Partners, and the Mecklenburg County Health Department, which operates the Safe Routes to School program. The city has used the network of its partners to expand community outreach. Partners have also taken an active role in a variety ways, such as making their own media appearances. The city and its partners try to reach as many community members as possible through a wide range of outreach and education efforts. The city has held several press conferences, aired public service announcements (PSAs) on the Charlotte-Mecklenburg Government TV channel, placed informational inserts in utility bills, and provided radio and TV interviews in both English and Spanish. Charlotte also maintains an active social media presence on Facebook and Twitter in addition to its website. Education activities include safety demonstrations with media coverage and providing Watch for Me NC campaign materials at special events and other activity hubs such as schools, libraries, apartment complexes, and parks. A number of street festivals take place in Charlotte each year. Charlotte uses these opportunities to distribute Watch for Me NC information to large crowds. Diverse segments of the public are also targeted via neighborhood meetings, parent classes at child care centers, Boy Scouts events at the Police & Fire Training Academy, and Learn to Ride classes. Charlotte has reached out to residents at the Levine Senior Center, multiple apartment complexes, the YMCA, and sporting events. The Charlotte-Mecklenburg Police Department typically conducts crosswalk enforcement operations involving several officers every few months. Enforcement events entail written warnings and citations to drivers for unsafe driving, such as failure to yield to pedestrians in crosswalks. Charlotte-Mecklenburg Police Department also gives written warnings to pedestrians for improper crossings. Due to the outreach efforts of Watch for Me NC partners throughout Charlotte, numerous residents from a wide range of backgrounds and age groups received safety messages in a variety of ways. These community engagement strategies have contributed to the sense that Charlotte residents have a greater awareness of road user safety issues than they did before the city’s participation with Watch for Me NC. Further, the Charlotte Department of Transportation has installed “turning vehicles yield to pedestrians” street signs in places with high turning crash rates to augment program messaging and increase safety. Charlotte plans to grow the program by building on its existing framework and adding Watch for Me NC language into policy documents. Partnerships are critical to effectively implementing the Watch for Me NC program in Charlotte. It has been especially helpful to partner with organizations whose missions are related to injury prevention, such as Safe Routes to School, Safe Kids/Safe Communities, and area hospitals. Thanks to Joe Mangum of the Charlotte Department of Transportation for providing leadership, time, and expertise that contributed to the Watch for Me NC Campaign in Charlotte and the information in this profile.